Protesters wearing yellow vests take part in a demonstration in Paris, Jan. 19, 2019. Clashes broke out throughout France on Saturday, as an estimated 84,000 "yellow vest" demonstrators took to the streets in a 10th consecutive weekend of protests against President Emmanuel Macron's government. The demonstrations passed off relatively peacefully in Paris where 7,000 turned up, although Reuters Television reporters saw scuffles briefly break out between police and demonstrators, some wearing masks, in the capital's Invalides district. Protesters threw firecrackers, bottles and stones at police, who responded with water canon and tear gas to push them back. "Macron, resign!" some protesters shouted. The protests, named after the fluorescent jackets French motorists are required to carry in their cars, began in November over plans to raise fuel taxes. The number of demonstrators on Saturday was roughly the same as last week's figure. The fuel tax hikes were subsequently scrapped, yet the movement has morphed into a broader protest against Macron's government and general anger over taxes and the cost of living. Police officers are seen in front of protesters wearing yellow vests during a demonstration in Marseille, France, Jan. 19, 2019. "How can we continue to live with so little?" said Bernard Grignan, a 65-year old retired manager who took part in the Paris demonstrations. In Paris, some demonstrators carried mock coffins symbolizing the 10 people who have died during the protests, mainly because of accidents when demonstrators blocked roads. December's demonstrations saw some of the worst violence in decades in Paris, as rioters burned cars and vandalized shops. 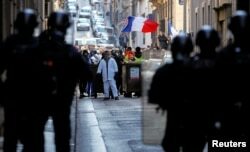 According to official figures, the biggest demonstration on Saturday occurred in the southern city of Toulouse, where around 10,000 people took part. The demonstration turned violent as evening fell, as protesters vandalized a bank and other shops. 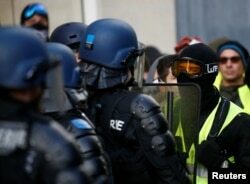 Protesters wearing yellow vests face riot police during a demonstration of the "yellow vest" movement in Angers, France, Jan. 19, 2019. Eight people were injured and there were 23 arrests. Reuters correspondents also reported disturbances in Bordeaux, Lyon and Marseille, while the local government building was attacked in Angers, northwest of Paris. French far-right leader Marine Le Pen — soundly beaten by Macron in the 2017 presidential election — is looking to take advantage of the "yellow vest" crisis and win ground in the May 2019 European Parliament elections. On Saturday, Le Pen reiterated her support for the protesters at a meeting near Marseille, at which she described the movement as a "legitimate" and "courageous" revolt. The Angers member of Parliament, Matthieu Orphelin, a member of Macron's LREM centrist party, said he would cancel talks with members of the "yellow vests" in light of the trouble in Angers. "It fills me with fury to see our beautiful town attacked in this way, in particular the damage caused to symbols of the republic," Orphelin said in a statement.